Vanlife Log, day 9. After driving long hours into the night, we woke up at another Truck Stop. We were in another unmemorable town. I bundled up, stepped out of the van into slushy ice, and shuffled myself to the restroom. My purse stocked full of the standard tools needed to freshen up on road trips. I had hopes that afterward, I would be filled with more positive energy. And not feel like I just woke up at a Truck Stop, in a van. With the addition of coffee, this short list of tools will have you feeling fresh, and back on the road in no time. If you have more time (or feel like splurging) you can almost always acquire a hot shower at any Truck Stop, for $15. And, I’ll go ahead and point out that is $15 per shower, not per person! Use that information at your own disgression. 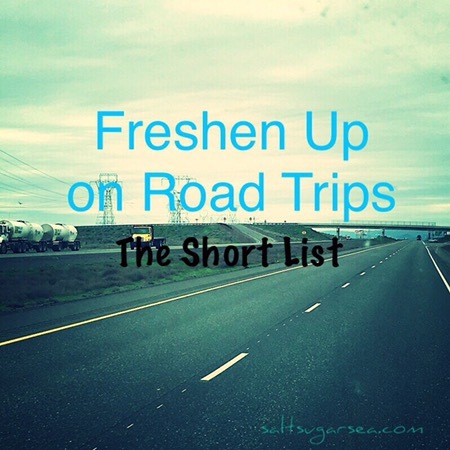 Here’s a longer list of ideas on FREE ways to freshen up on the road, our best finds for extended road trips.